We are engaged in trading of a comprehensive range of Retro Reflective Sign Board. 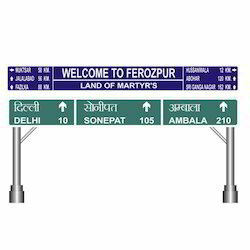 We are highly experienced manufacturing firm offering premium grade Retro Reflective Sign Board. These sign boards are created by using the UV cured inkjet printing technology to assure its rugged performance in harsh weather. Specially developed with the latest highly reflective prismatic lens sheeting, the offered sign boards can be ordered in custom sizes at a nominal price.